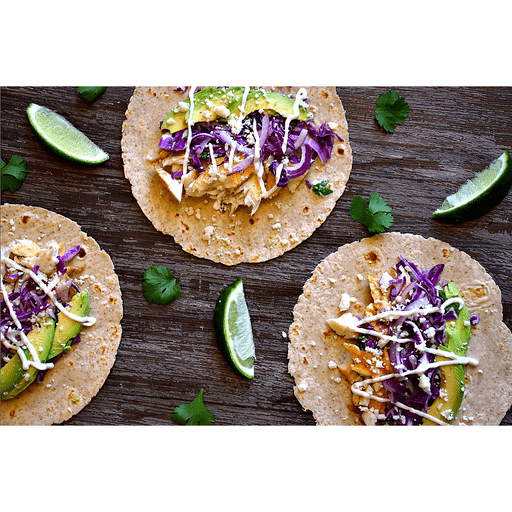 With succulent fish, a splash of lime, fresh slaw and a blend of spices to kick up the heat, these light tacos are the perfect excuse to fire up the grill! 1. In a medium bowl, whisk together 2 Tbsp. canola oil, 1 ½ Tbsp. lime juice, garlic, chili powder, cumin, paprika, cayenne, salt and pepper. Place fish into a gallon size resealable bag and pour marinade over fish. Seal bag, gently move bag around to evenly coat fish with marinade, and marinate 20-30 minutes. 1. While fish is marinating, prepare red cabbage slaw. Add cabbage, red onion and cilantro to a medium bowl. Pour remaining 1 ½ Tbsp. lime juice and 1 Tbsp. canola oil over top and season lightly with salt and pepper. Toss to evenly coat. 1. When fish is done marinating, preheat a grill to medium-high heat. Brush grill grates with oil and place fish on grill. Grill until cooked through, about 3 minutes per side (cook time will vary based on thickness of fish). Transfer to a plate, break into pieces and serve in warmed taco shells with cabbage slaw, avocado slices and other optional toppings. Top with sour cream, nonfat plain Greek yogurt, cotija cheese, hot sauce or salsa. Calories 500, Total Fat 28g (Saturated 3.5g, Trans 0g), Cholesterol 75mg, Sodium 170mg, Total Carbohydrate 32g (Dietary Fiber 10g, Sugars 7g), Protein 36g, Vitamin A 20%, Vitamin C 70%, Calcium 8%, Iron 10% *Nutritional values are an approximation. Actual nutritional values may vary due to preparation techniques, variations related to suppliers, regional and seasonal differences, or rounding.